Science-fiction author John Scalzi is having a big year. Just a few weeks ago he inked a multi-book multi-million dollar publishing deal. And his new book The End of All Things will be out August 11. 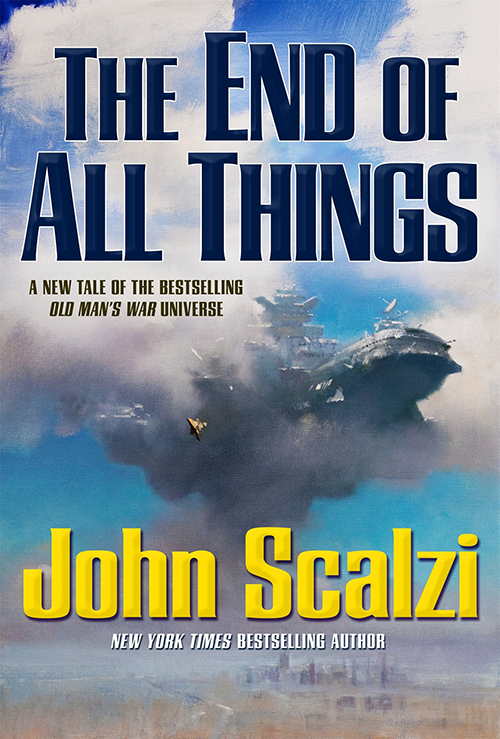 You can read excerpts from the first four chapters (Chapter 01, Chapter 02, Chapter 03, Chapter 04) of The End of All Things, which is the second book of the Human Division, set in the Old Man’s War universe. The whole Old Man’s War universe/storyline revolves around John Perry, a 70+ man who who enlists in the army and transfers his consciousness into a younger, more battle-ready body. So the wars rage on among the stars with troops in enhanced bodies while having the wisdom and humor of “old men”. Parts of it borderline on cute. But the books are fast paced and just plain fun to read. Which is why I think it’ll make a great TV show on SyFy. At the end of last year, it was announced that the Ghost Brigades TV show was in development. It gets its title from the 2006 book by Scalzi. So a new book, a new contract, and a new TV series. No doubt John Scalzi is staying super busy this year. Have you read any of John Scalzi’s books?